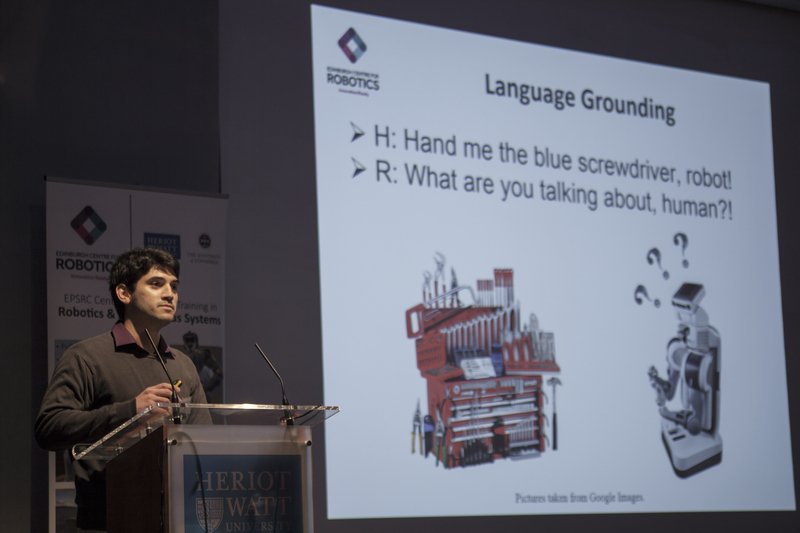 On Friday 23rd October 2015, the first Edinburgh Centre for Robotics took place in the James Watt Centre II at Heriot-Watt University. 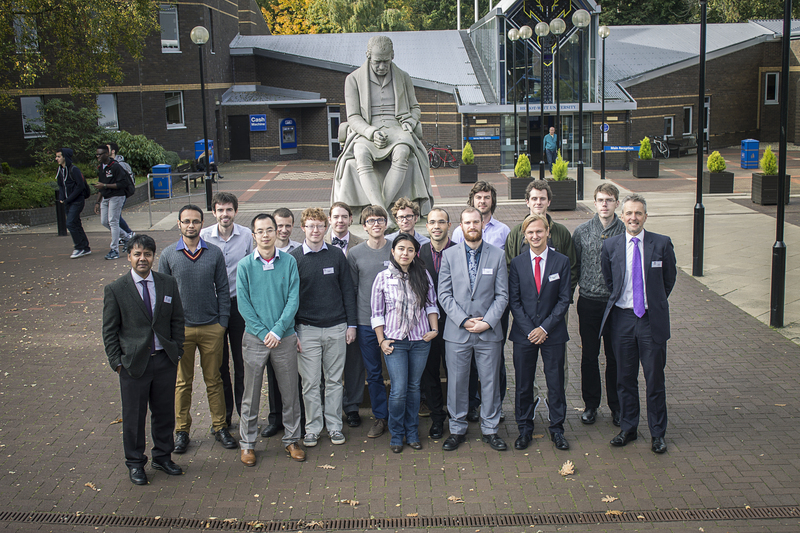 Industrial delegates, academic staff and students (CDT & aligned) attended the event. 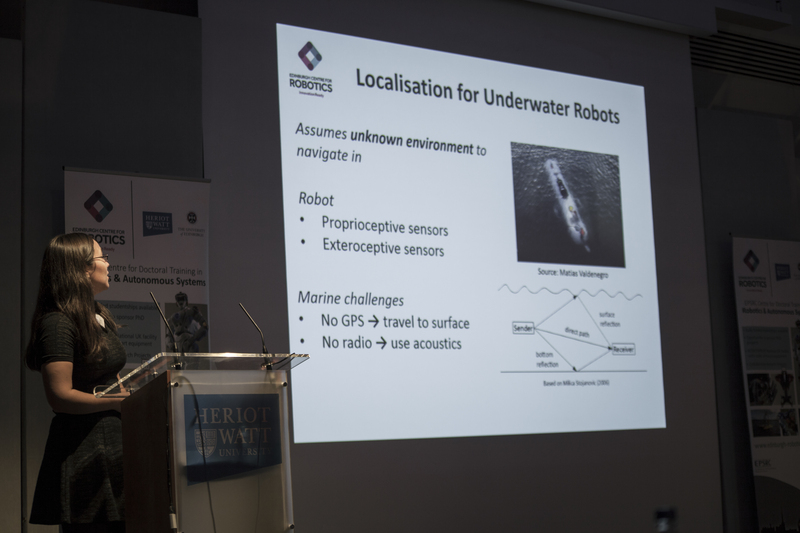 Professor Peter Corke, from Queensland University of Technology in Brisbane, Australia, opened the Conference with his talk “Why Robots See?”, which highlighted the similarities and differences between human and robot visions, as well as pondered on the future of Robotics in relation to recent advances in Computer Vision. 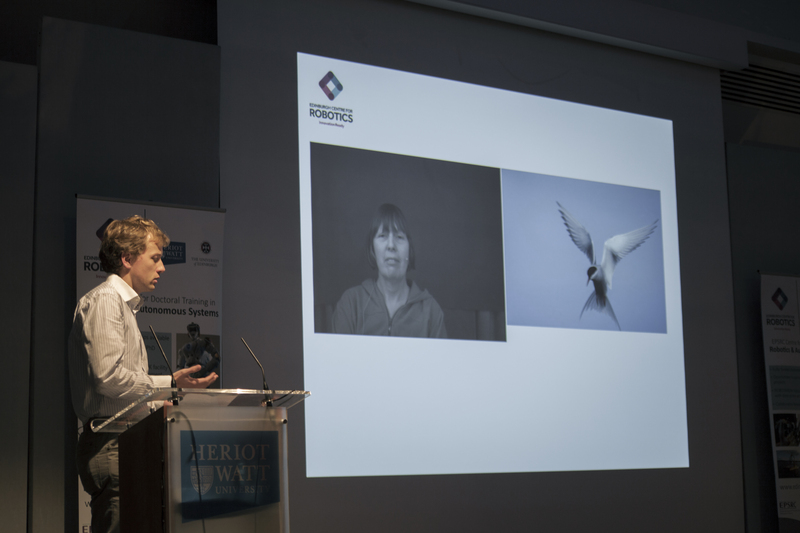 An overview of the Centre’s activities followed Professor Corke’s talk. 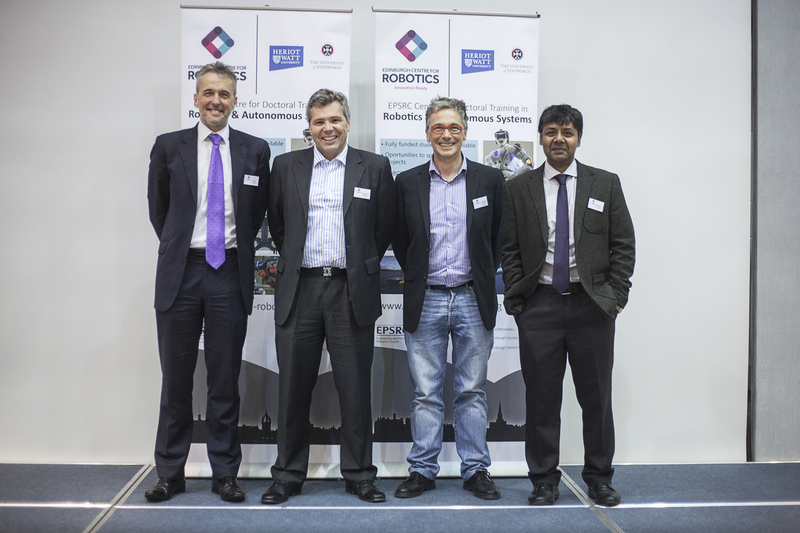 Professors David Lane and Sethu Vijayakumar (Directors of the Edinburgh Centre for Robotics) welcomed and introduced the new cohort of students to everyone present at the Conference; gave an update of the Robotarium facilities (Heriot-Watt University and the University of Edinburgh). 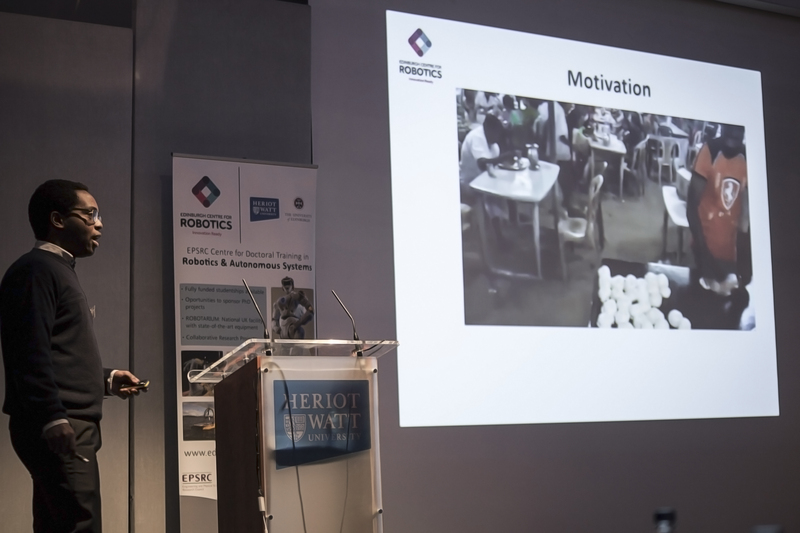 New Robotarium equipment will arrive during the next months and there will be a Robotarium launch next year, to which delegates from industries and Universities will be invited to attend. 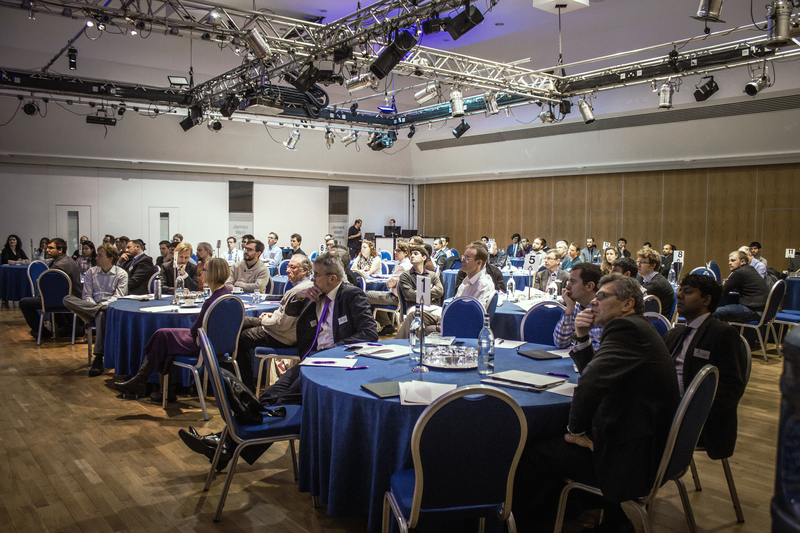 Please refer to our Annual Review 2014/2015 to find about the Centre's activities throughout this last year. 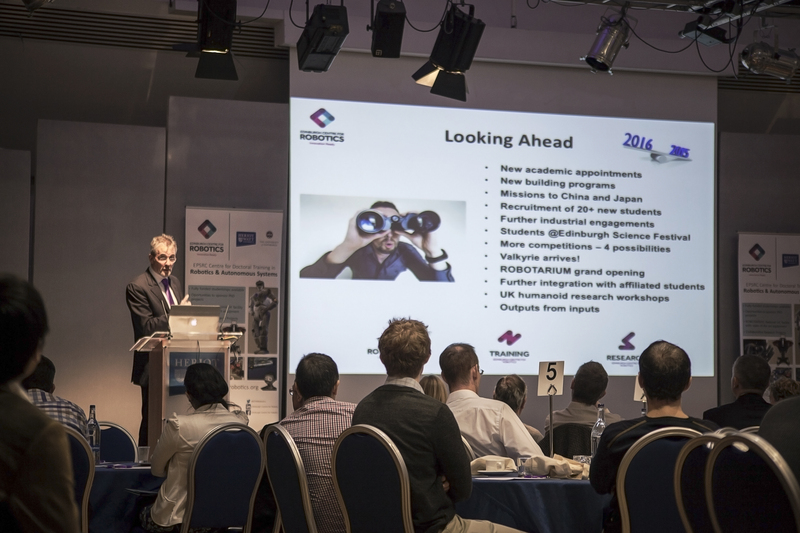 Professor Nick Weston’s talk about the Benefits to Industry of Sponsoring a Ph.D. student. 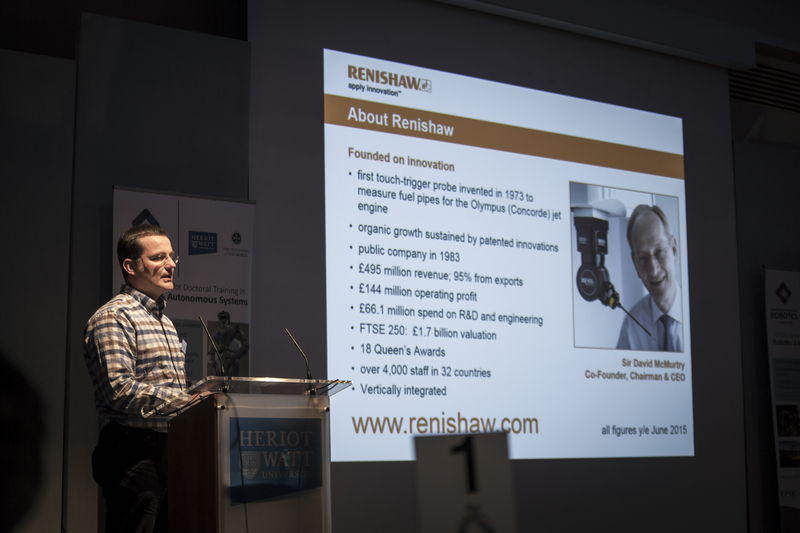 Professor Weston, from Renishaw, first gave an overview of the research success and innovation carried out at Renishaw. 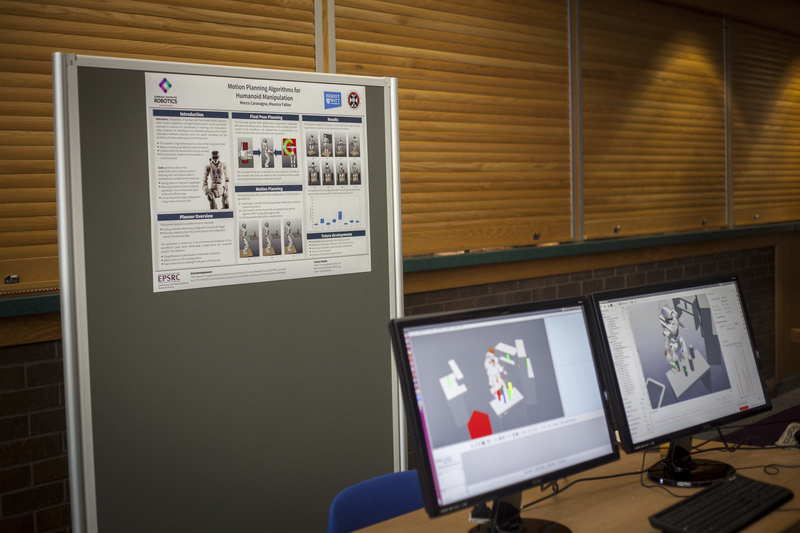 He then pointed out that all of Renishaw’s staff have multiple skills and that sponsoring a Ph.D. student has turned out to be beneficial for the company because each student represents the possibility of a future member of staff or a long-term relationship with a future academic partner. 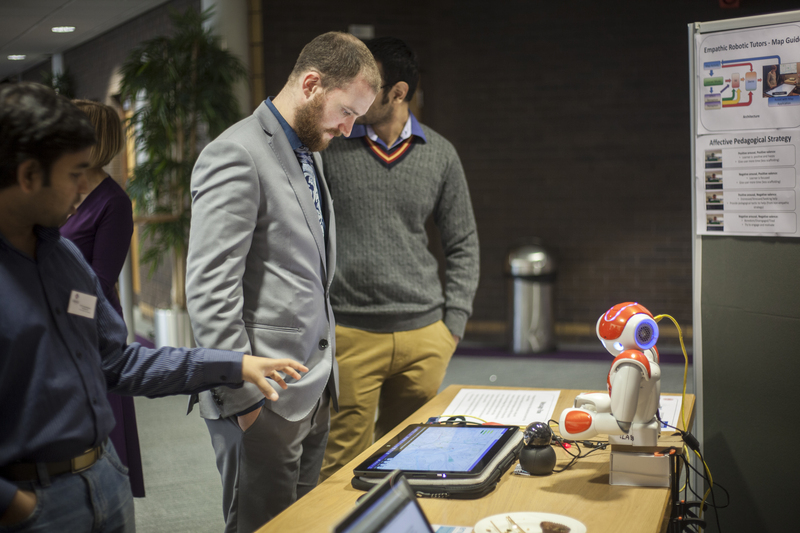 In exchange, the students benefit from getting industrial experience and helping them decide whether they wish to stay in academia after their Ph.D. degree or pursue a career in Industry. 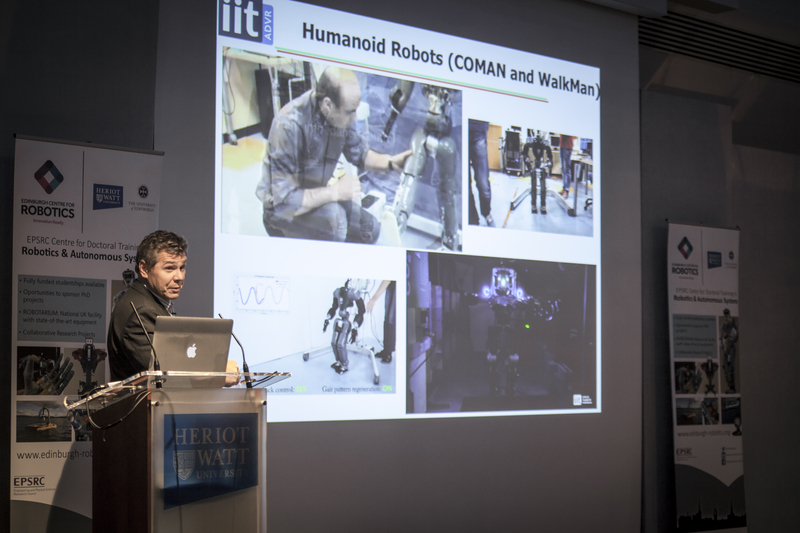 Professor Darwin Caldwell, from IIT Genoa, also presented a talk on Humanoid and Quadrupedal Robots. 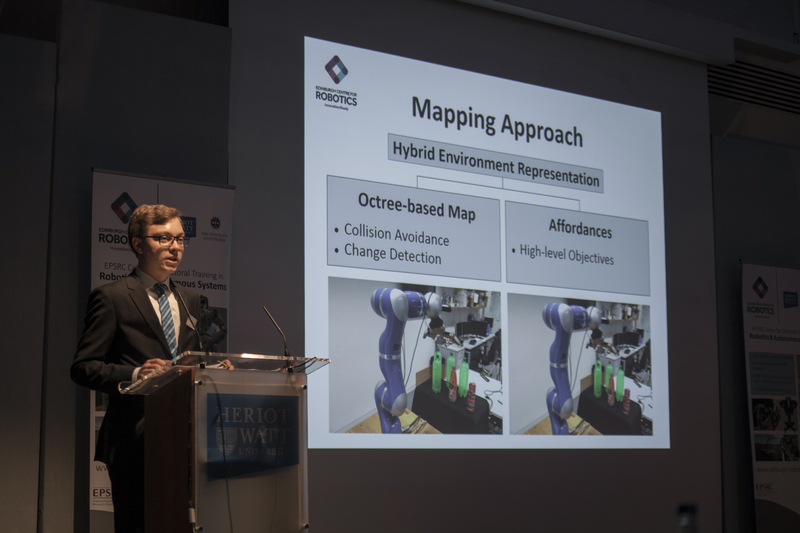 The Robotics Department in IIT Genoa is currently researching hydraulic Quadrupedal Robots, which have better stability than the Humanoid Robots seen in the DARPA challenge earlier this year. 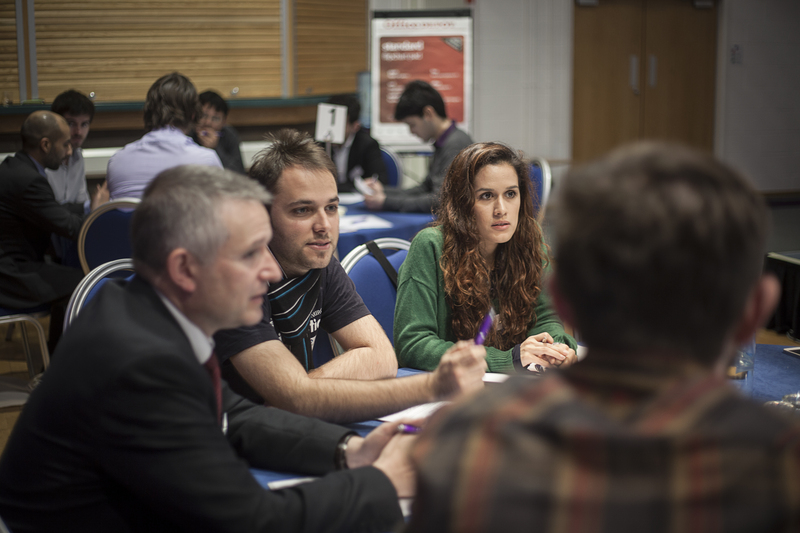 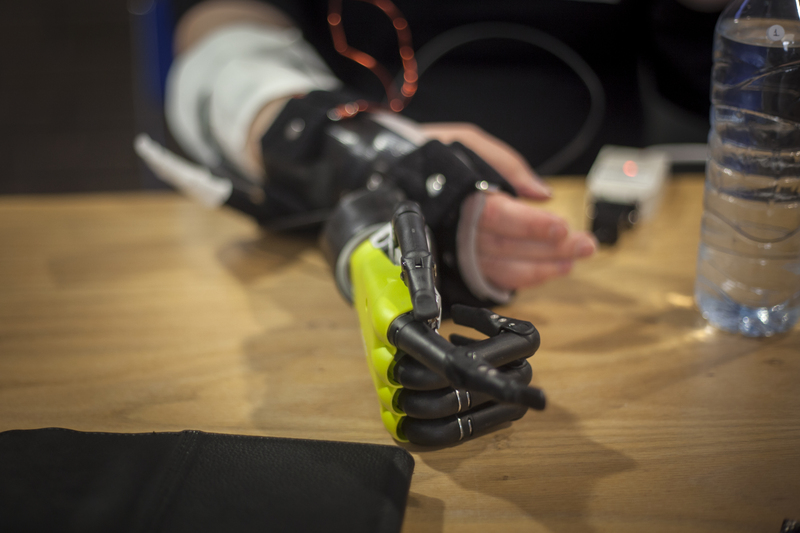 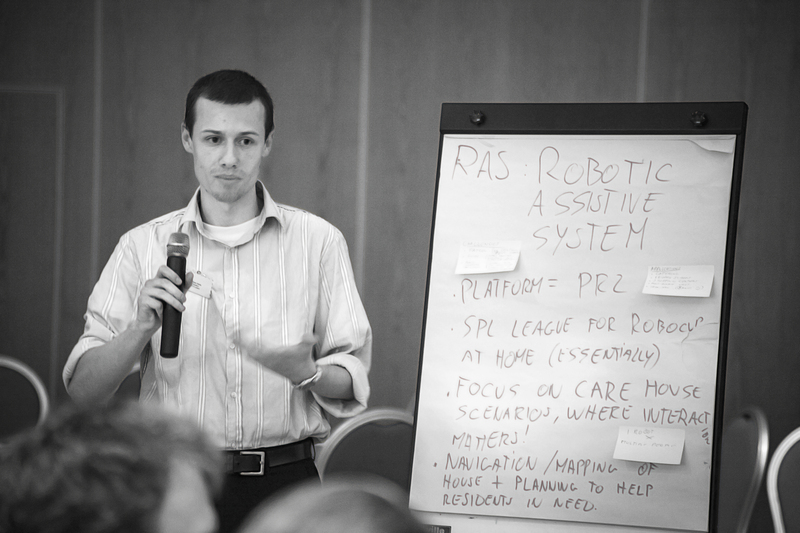 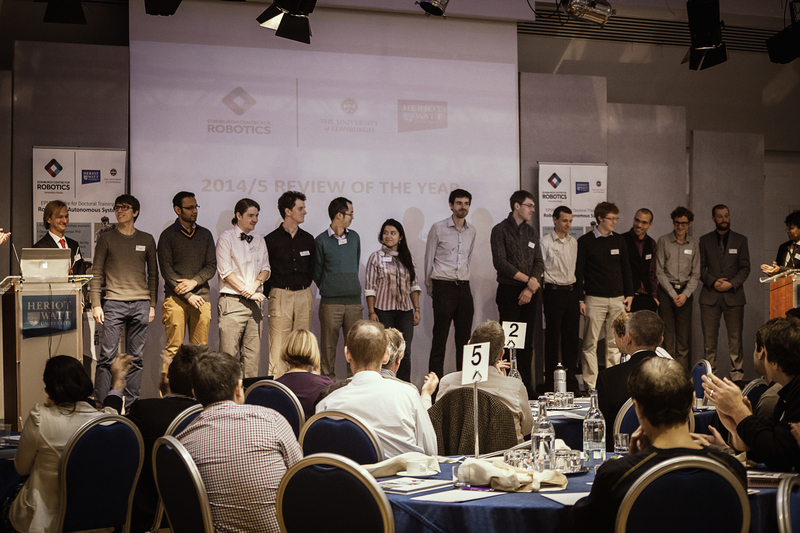 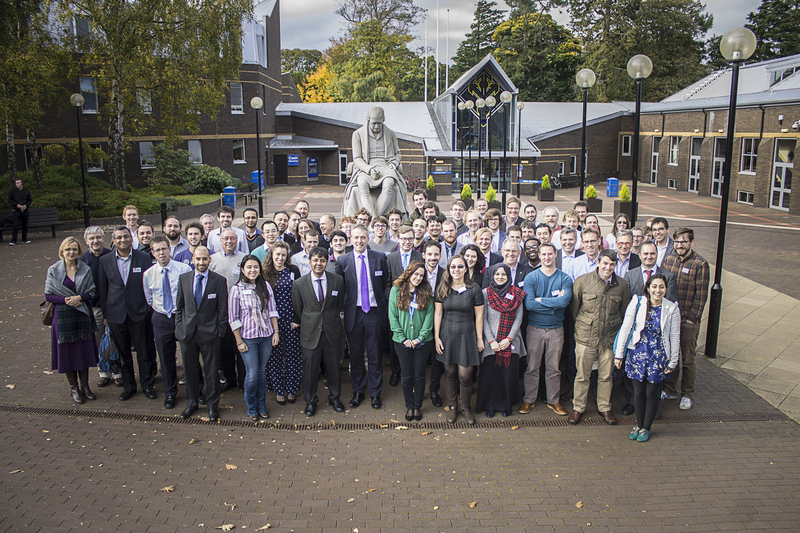 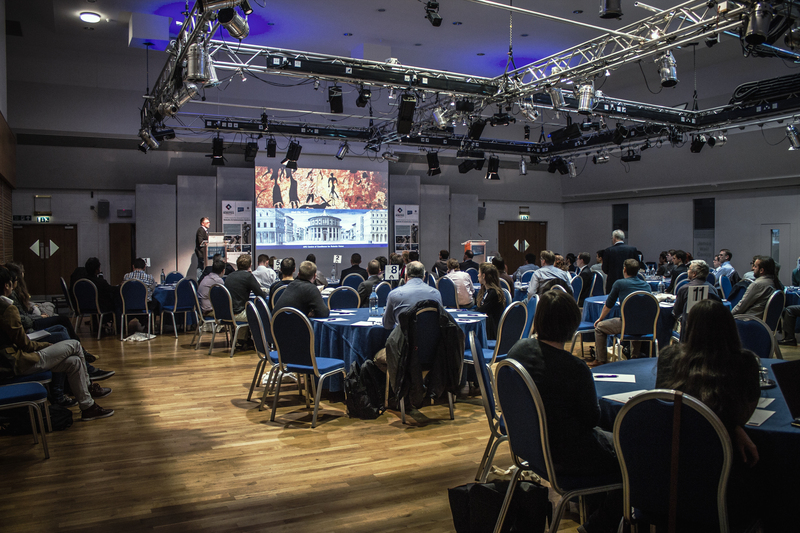 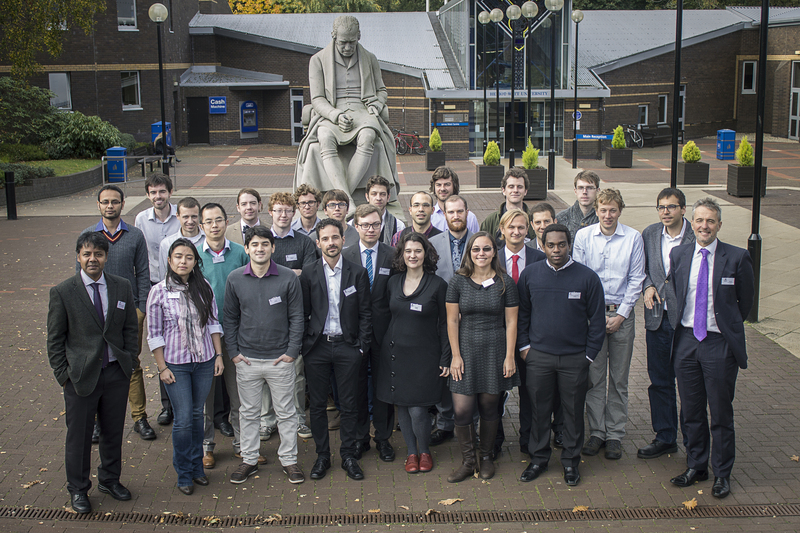 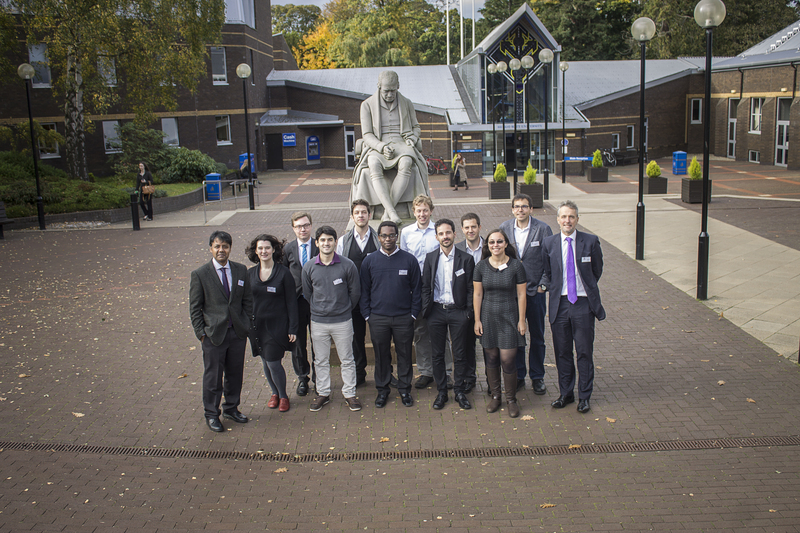 The Edinburgh Centre Robo 2014 cohort presented their research projects. 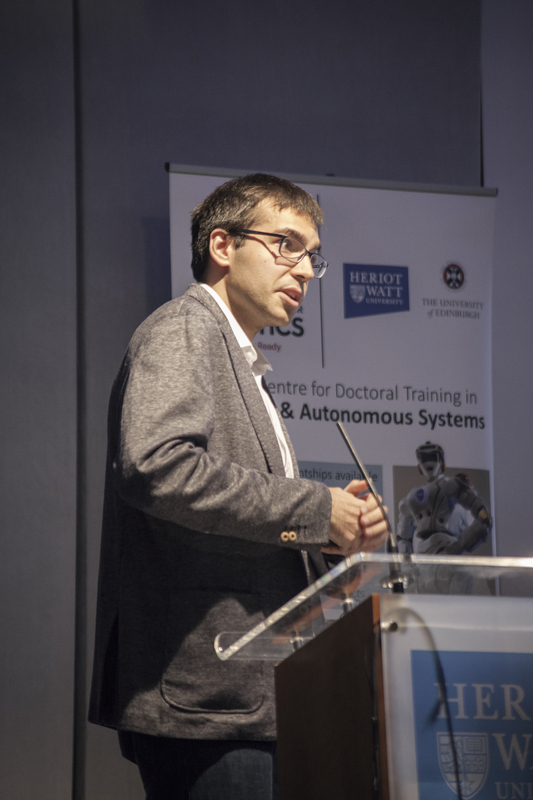 They have been working on their projects right after successfully achieving their MSc by Research Award at the University of Edinburgh and Heriot-Watt University. 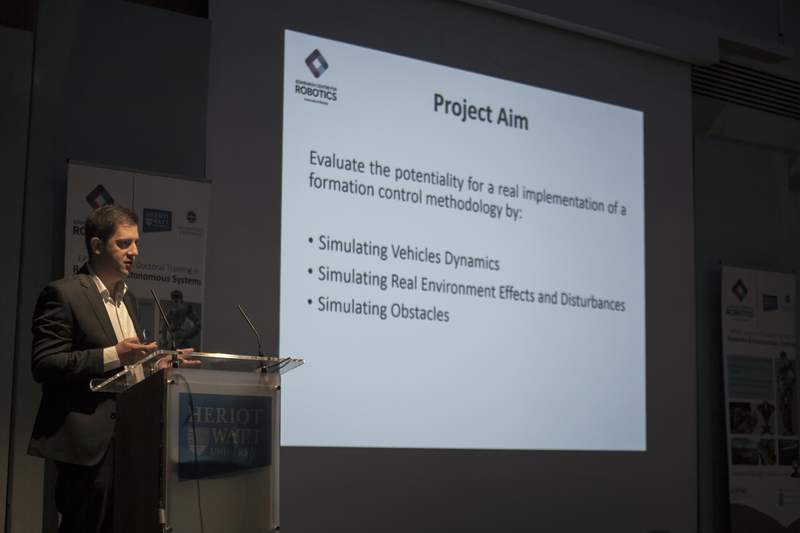 The last session of the Conference was an interactive session between industrial delegates and students, where each group designed and justified a Robotics & Autonomous Systems project that could be doable in a year by a 3-4 small student teams, develop a capability to address a market need. 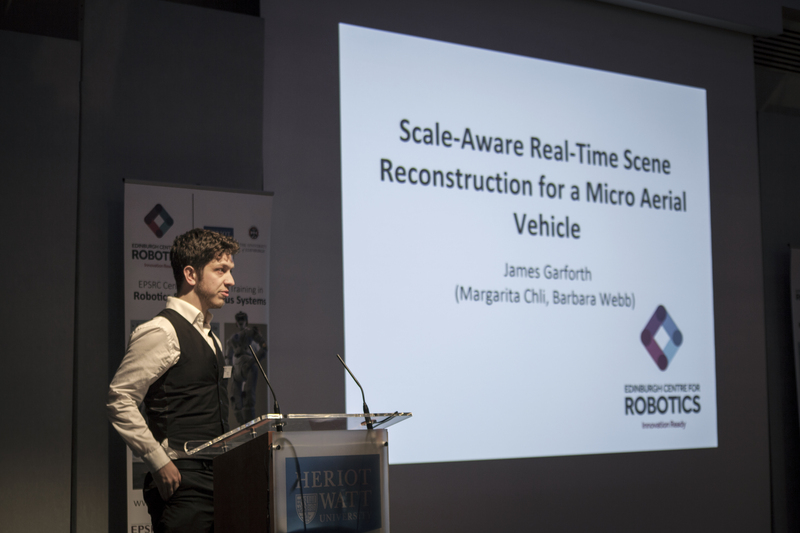 The imaginary kick starter budget was £20k and the Robotarium facilities were available for this project. 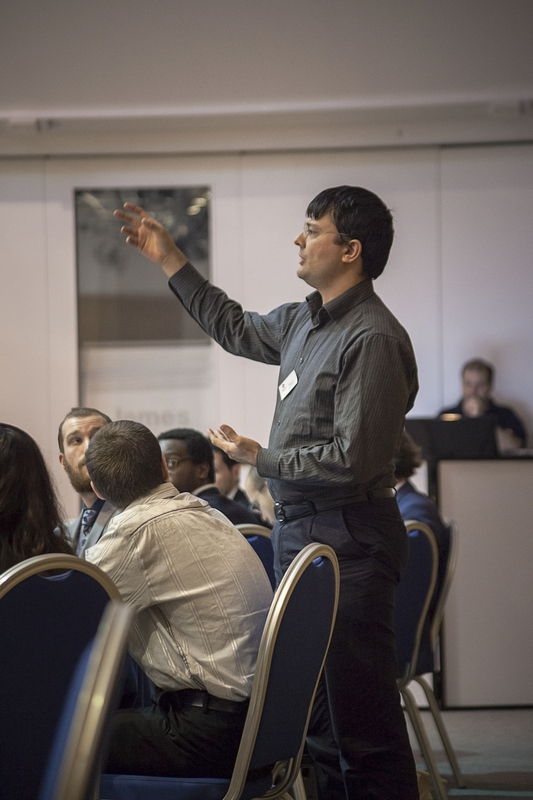 At the end of the session, each group justified their project in 2 or 3 minutes with a round of questions and answers. 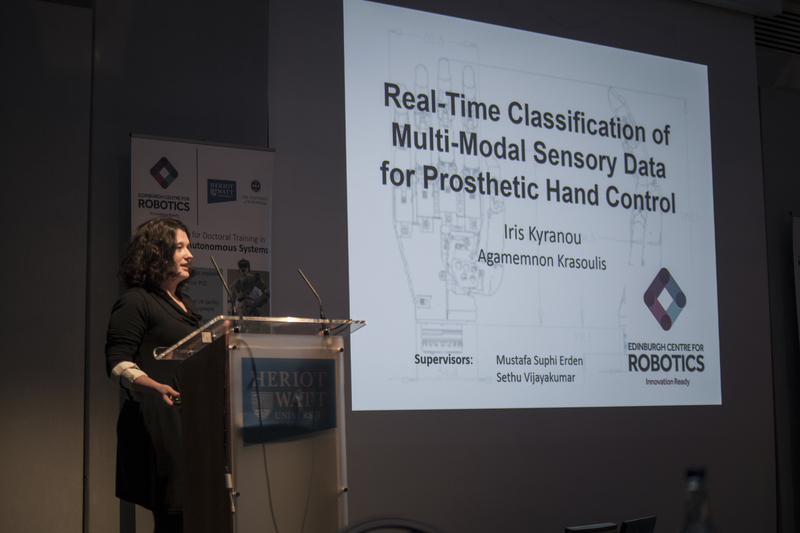 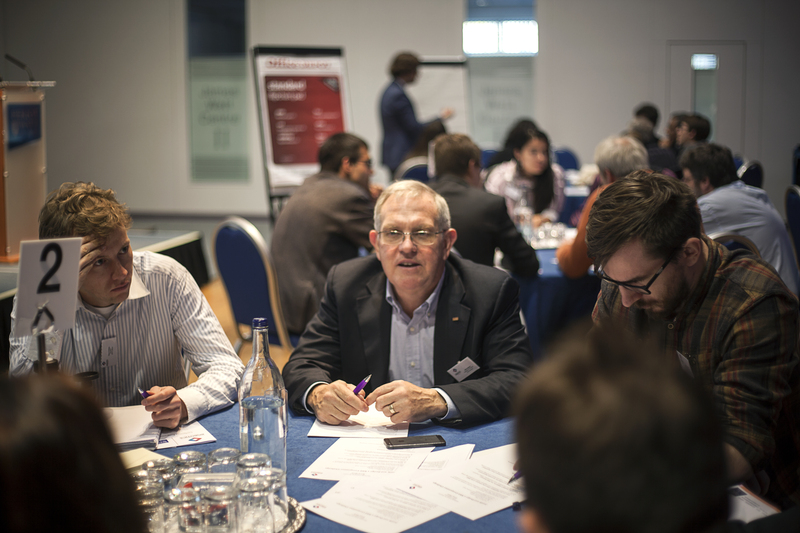 Overall, this year’s Conference proved to be successful and a great opportunity for industrial delegates to learn about the research activities carried out at the Centre by our academic staff and students. 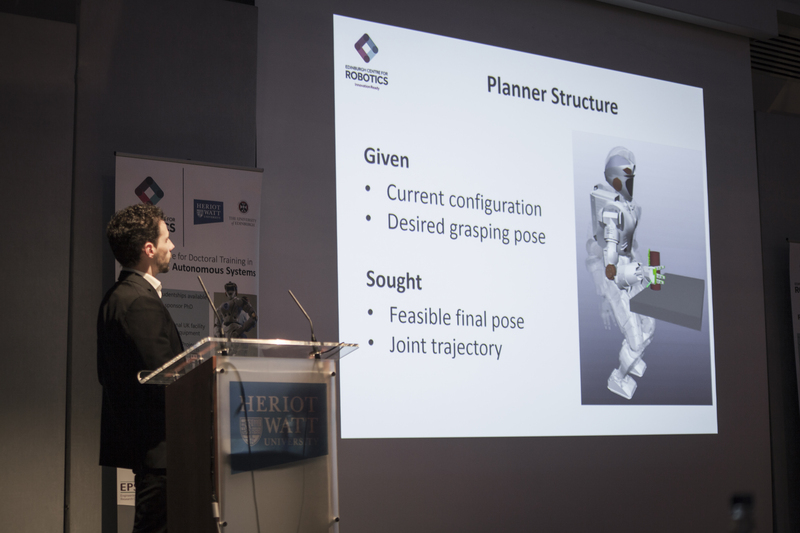 We are already looking forward to and getting ready for next year's Conference and Robotarium Launch.